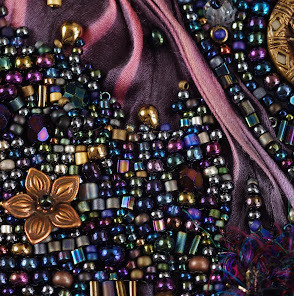 Snippets from a bead artist. I was even more reluctant than usual to try out the new Czech twin beads, as I had heard an awful lot of bad press, especially about uniformity. But then I saw a tutorial that I really really wanted to try out, and it used the twins in a rope - and I am a sucker for ropes of all kinds. Since I didn't have any at all, I went shopping around and found some twins that had the most awesome matte color, and then some that had a great metallic shine... and so of course ended up buying a few shades more! 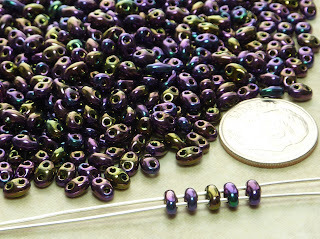 When they arrived, I spilled them all out on my bead mat to check them out, looking to see how many of them would be unusable (half a bead, no hole, or all hole, lol). I honestly didn't find as many as I expected to; maybe fifteen or less out of 8 grams. Then, I checked out how thin/fat they were compared to one another, and that's when I really noticed the difference. They seem to have one size of HUGE and then one size of teeny tiny thin, and I found that I would need to separate those from each other while working or it would drive me nuts. The next play session came from a thought I had, wondering if a flat spiral would work with the twins despite two holes rather than one - and it did!! 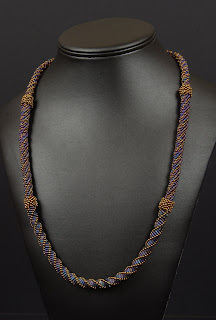 I had some false starts with this one, as I couldn't quite find how to get from one place to the next without huge amounts of thread showing, but I think I have it knocked - as long as you use thread that is very similar in color to the bead, or use smoke Fireline... I tried it with white thread and it still showed much too much for my taste. I also think that this one would be more supple and have a nicer drape if I used Nymo or One G rather than Fireline - and I can't believe I said that because I never use anything but Fireline! I've had two requests to make this one into a tutorial... what do you think?? All in all, I think I've made friends with the twin beads, and I hope I can think up something else to play with using them. My next challenge will involve the long magatama beads... and I am stumped on this one, it will indeed be a challenge! Triple Twist Tutorial Is Here! 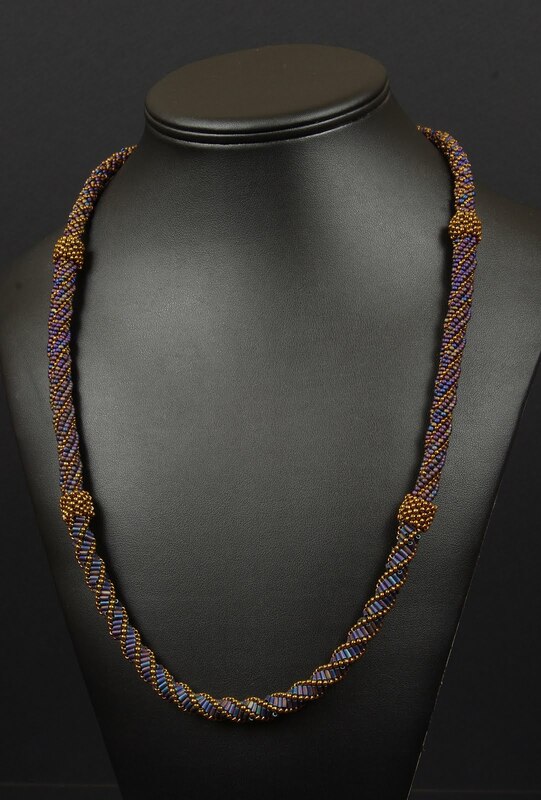 In my last post, I asked everyone's opinion on which of three designs you all would like to see me make a tutorial for most... and I am soooo happy to say that Triple Twist is the necklace that won out! I gathered all the votes together for it, and my pup picked out Judy Lovell's name from the mix, and she now has a copy of the finished tutorial. Thanks so much for commenting, Judy! It's taken awhile -and I'm sorry the delay was such a long one! - but it's finally finished and ready to be out there, so I have listed it today in my shop. 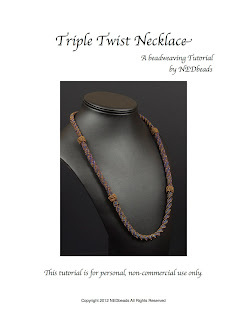 If you'd like to make your own Triple Twist, come and check it out here!! I've been horrible at keeping up with my blog this last year, and I am going to try to do much better this year. I am hoping to have a post a week... we'll see how much life lets me get away with! !